There are very few people in Jerusalem who have not heard of or do not know Shaykh Raed Salah and I am no exception. He actively been at the forefront of every Arab-Israeli issue face to face with the Israeli authorities. I have personally known him for over 9 years and it is this acquaintance which prompts me to pen this press release. The idea of Shaykh Raed Salah being charged in the United Kingdom with anti-Semitism is astounding. The accusations in Israel are not new and in the past the Israeli authorities have often made such accusations but when it came to evidence, they had none and so despite their best endeavours were unable to press charges. That these accusations are baseless is no surprise to me. From my personal dealings with Shaykh Raed I have never found him to be anything but gentle mannered, cordial, understanding and concerned for the welfare of everybody in Jerusalem. While he is relentless in his efforts to preserve Palestinian Christian and Muslim heritage within Jerusalem, he has never blamed the Jewish people or Judaic faith for the actions of the political entity that is referred to as the state of Israel. 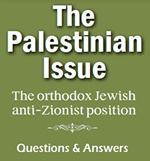 On the contrary he has always made it his personal goal and responsibility to distinguish between Judaism-the religion and its practitioners and the political establishment - the Zionist state. The good Shaykh has consistently expressed his friendship and brotherhood for the Jewish People and publicly embraced myself and my Jewish brethren countless times. In the face of the real and distinct possibility of being accused of being a traitor to his own people, the Shaykh has shown the courage and self sacrifice, in the name of truth and peace, to take this righteous and courageous stand. It therefore appals and deeply pains me to see how Britain is dealing with Shaykh Raed Salah, a man who has been hounded in Israel for simply wanting to preserve the identity and heritage of his people and nevertheless strives to uphold and save our holy and peaceful coexistence. 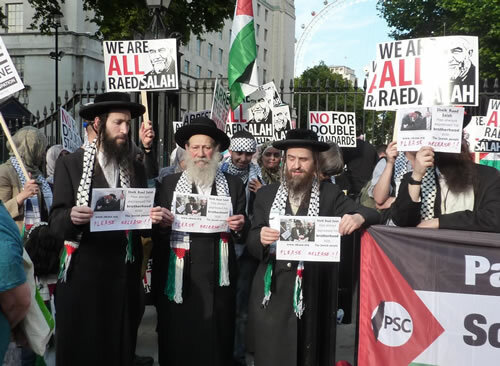 On behalf of my fellow Orthodox Jews, I humbly appeal to the British government and authorities to release Shaykh Raed Salah and to return to him his freedom of movement and freedom of speech. Only through dialogue and actions of such good and courageous men can we all hope to have peace in Jerusalem. To repay his efforts with detention, arrest and vilification, makes a mockery and destroys this most critical attempt at reuniting and repairing our age-old society of Muslims, Christians and Jews. This simply plays into the hands of those who wish to solidify and perpetuate the impression that there is an ingrained hate and irreparable rift between Jews and Muslims. This arrest will sadly only accomplish to convey the message that efforts at reaching out one to the other is futile. This arrest, may the Almighty protect us, can most certainly bring to the exacerbation of anti-Semitism. This arrest, may the Almighty protect us, will only advance the vicious cycle of continuous mistrust, animosity, and ultimately what follows. We call upon on all peace loving friends of Jews and Muslims to appeal to the good government of Britain to expedite and immediately free Shaykh Rayd Salah and vindicate those who seek world unity, peace and harmonious coexistence.